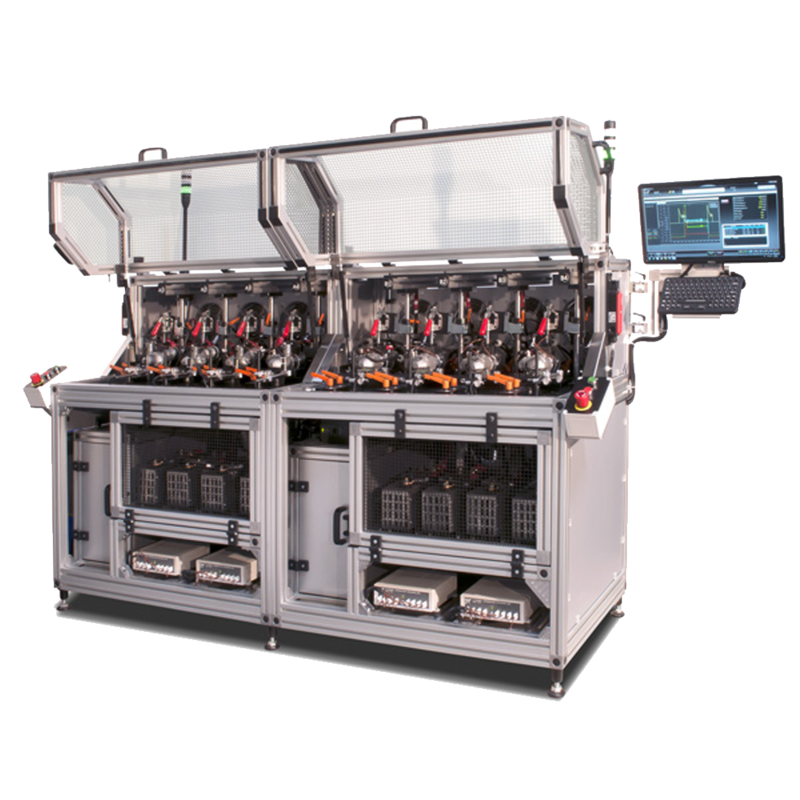 The ST-408 is a simultaneous dual-mode operation system for testing starter free-run and starter solenoid endurance. Its unique 8-station design is divided into two distinct sections of 4 nests which can perform the same test or separate Solenoid and Starter configurations simultaneously. Thank you for your interest in the ST-408. Please fill out the form below so we can send you the brochure. Thank you for your interest in the ST-408. Your request has been submitted to our sales department, and we will get back to you soon. Evaluation of starter motor wear characteristics such as mechanical and electrical faults that could appear during starter lifespan when the starter runs at high speed. This includes brush wear, bearings wear, heating effects, etc. Evaluation of Solenoid failure modes including heating effects, spring problems, plunger wear, contact problems and other faults. Unique 8-station design is divided into two distinct sections of 4 nests which can perform the same test or separate solenoid and starter tests simultaneously. Solenoid endurance testing can be performed with the motor connected or disconnected with an inductor to simulate the motor. This is used during the block test to prevent the pinion from spinning but still simulating the motor coil so current can be applied to test solenoid contacts. Starter mounting via a rigid “V” support or fixed by starter mounting ears. This allows for faster installation in a V block with clamping, or attached to a fixture and bolted through the mounting holes on the starter for a solid mount. Adjustable block location fits and accommodates a wide range of starter sizes up to 1.8 kW. This allows for a wide range of part testing capabilities while attaching the device that is used on block the pinion. Adjustable vertical/horizontal mounting system strong for block test and no starter movement while testing. This enables 4 points; V-block or mounting fixture, free run or block test. Flexible mounting to accommodate flange and pad type mounting of starters. Software allows for customizable database and test specifications for each part. Four dedicated TMUs with 32 channels offer temperature measurement of each starter at various locations. A built-in mechanism offers the ability to stop testing if temperature goes to high. Eight speed sensors with adjustable position measure free-run speed.